As I commence my first blog post for 2012, let me welcome my 90th blog follower. Welcome Phil Barnes to "A Letter From Kabwata". We are slowly inching towards 100 followers. Let me also thank the many others who follow through email. It is good to know that people "out there" are reading what takes me quite some time to put together! I have asked about eight Bible Colleges in Zambia that I would recommend to anyone to send me some information about themselves. This is in order to introduce them to my blog readers. They are certainly worth your support and onward commendation. It is for that reason that I am involved in one way or another with each one of them. I will be posting their details in the order in which they have sent me their information. As you will soon discover, their programs and fees do not fit every potential student. So, if you ever want to do theological studies in Zambia, look at the full list and then choose the one that best approximates your need. At least I can guarantee good quality input from the lecturers! The first Bible College that sent me its information was the Lusaka Ministerial College, started by James Williamson some time in 2010. I will let James speak for himself. My family and I moved to Zambia in January 2010. I had visited several times starting in 2006, and came to Zambia as a missionary sent by my home church in Louisville, KY, for the purpose of assisting with ministerial training in Zambia. Shortly after arriving in the capital Lusaka, I began to get to know a couple of Reformed church planters under our new church home, Kabwata Baptist Church. 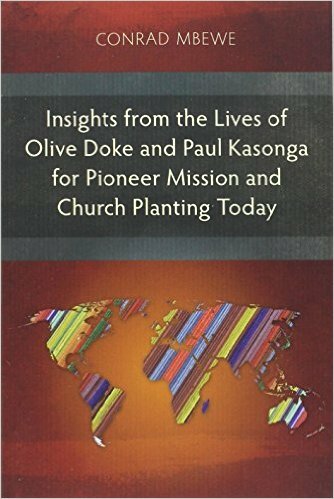 One of these church plants was located in Kabanana. It became clear that there was need and desire for ministerial training among the pastors in these places. I consulted Pastor Mbewe about this need, and was encouraged to pursue the work of establishing a training program for ministers in these communities. Pastor Mbewe said these are “orphans raising orphans,” spiritually speaking. We met with the ministers’ fellowship in Kabanana and told them of our plans and invited them to participate. My Reformed friends in these areas invited pastors from other denominations to come as well. 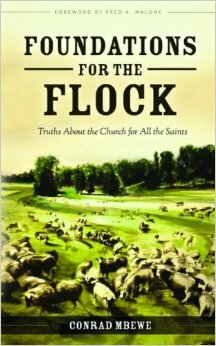 In addition, during the months leading up to the start of the college, I asked various experienced pastors to help us in this work. They were very generous to give their time and energy to LMC, and continue to do so to this day. In May of 2010, we began meeting in Kabanana. We had about 12 students at first, and over the next half year the number increased. Eventually, the building we were renting was reclaimed for other uses by the landlord, but we soon found a more accommodating and permanent home at Emmasdale Baptist Church. 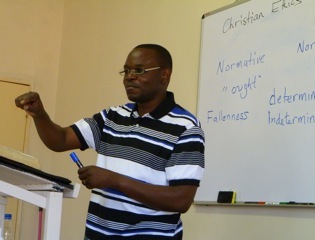 Its pastor, Isaac Makashinyi, teaches Greek and other courses for the school. The location has the benefit of easier access for several of our students, and has made us able to reach other compounds since it is on one of the main routes for the minibuses. The college meets every week on Wednesday and Friday from 8:00 to 14:00. We also have classes every Saturday for those who work full time during the week. The college operates on the typical Zambian school schedule of three months on, one month off. Students can enter at the beginning of each term in January, April, and August. We encourage any interested students to “come and see,” with no obligation to join before they get a taste of what the college is like. 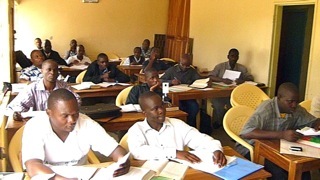 We have about 25 students in total registered as of the end of December 2011. Three of the key requirements for students applying to the school are: 1. a satisfactory completion of secondary school; 2. a clear testimony of conversion and understanding of the gospel; 3. a call to/desire for the pastoral ministry affirmed by his church. We make clear our theological convictions, and have the 1689 Confession of Faith as our doctrinal standard, but we invite students of various denominations to study at the college. 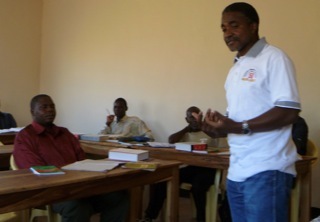 The whole of the curriculum for LMC is intended to equip and develop men for pastoral ministry in the local church. The school offers ascending levels of study from what we would consider the bare minimum basics for a local pastor to more advanced studies in the different fields. The full Bachelor’s Degree level curriculum takes about 3-1/2 years to complete. Lecturers for LMC include: Victor Kanyense, Ronald Kalifungwa, Conrad Mbewe, Isaac Makashinyi, Kennedy Sunkutu, and Grave Singogo. Some of the courses offered are: Doctrine of God, Interpretation of Scripture (Hermeneutics), Preaching, Pastoral Counseling, Christian Ethics, History of the Reformation, The Holy Spirit, Doctrine of Salvation, etc. Speaking on behalf of the college, I’m very thankful to these men for putting in so much for the sake of training our students. 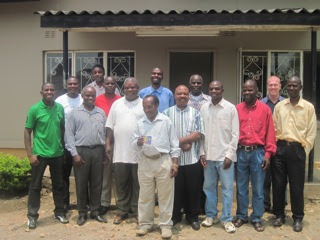 I do not hesitate to say that this group of pastors is undoubtedly the best theological faculty in Zambia. 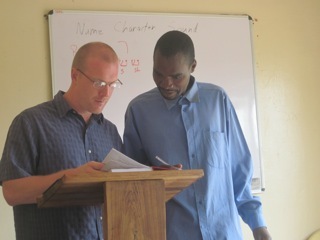 It is a blessing and privilege to work with them, and to provide our students the opportunity to learn under such men. One of the requirements for students is that they attend services of the church at which their instructors preach at least once a month. 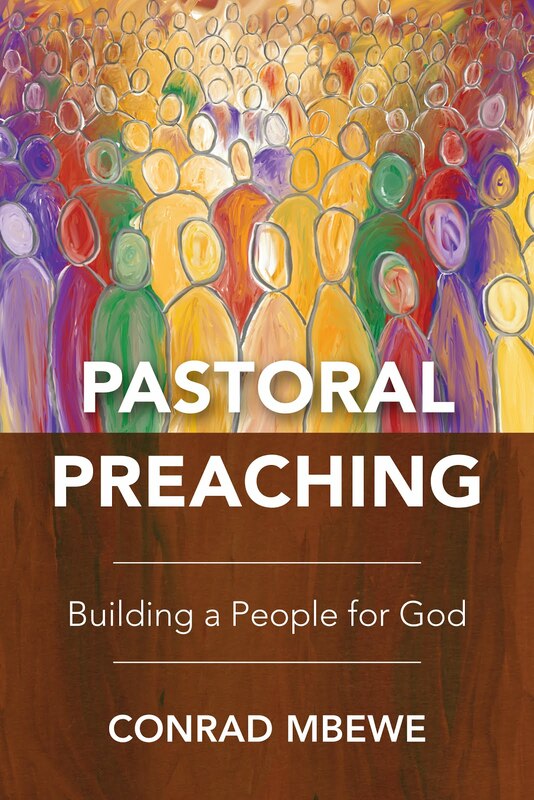 We also are developing a mentorship program so that each student has significant one-on-one time with a professor with which they are paired, in order to discuss the nuts-and-bolts of pastoral ministry in a more informal and detailed way. But students also need to be self-learners. We feel that personal study of Bible dictionaries and reference material, commentaries, systematic theologies, and practical ministry books like Spurgeon’s Lectures to My Students are a vital part of the student’s studies. Therefore, all students are given access to a large library of theological books located at Kabwata Baptist Church. But also, all students of LMC are eligible to purchase a Kindle pre-loaded with over 50 theology books, which serve as basic resources for study. The Kindle is available to students at a cost of only 500,000 kwacha (about 100 dollars), which is less than half the cost to the school itself. Anyone from Zambia interested in information about the school should contact Isaac Makashinyi or one of the other men listed above. To apply to the college, contact Andrew Sinkamba, our college administrator, at +260 966 497 317. Lusaka Ministerial College is only 1-1/2 years old. We are still developing and growing. And that means that we would very much appreciate your prayers and support for this work! Because we are working with many pastors who cannot afford tuition, the school is, in effect, a labor of love that gets its support from churches and individuals in the US and in Zambia. If you are interested in supporting one of the students, or in some other way contributing to the work of the college, you can write to lmczambia@gmail.com. Thanks in advance for remembering this work before the throne of Grace! Will Chasefu Theological College (CCAP) make the list? What makes me smile most is that almost all of them is locals. Radagast, I am hearing of Chasefu Theological College for the first time. Let me sniff around and see what scent I pick up. Who knows what T-bone steak I may have been unaware of? Thanks for bringing it to my attention. PRAISE THE NAME OF JESUS, AM GODFREY, AM UGANDAN WORKING IN CONGO AS A MISSIONARY. I WOULD LIKE TO ATTEND YOUR BIBLE COLLEGE SO AS TO GET MISSION TRAINING. AM APPLYING FOR SCHOLARSHIP. I WANT TO START AS SOON AS NEXT YEAR. THANKS .